Background Despite over a decade of efforts to reduce the adverse event rate in healthcare, the rate has remained relatively unchanged. Root cause analysis (RCA) is a process used by hospitals in an attempt to reduce adverse event rates; however, the outputs of this process have not been well studied in healthcare. This study aimed to examine the types of solutions proposed in RCAs over an 8-year period at a major academic medical institution. Methods All state-reportable adverse events were gathered, and those for which an RCA was performed were analysed. A consensus rating process was used to determine a severity rating for each case. A qualitative approach was used to categorise the types of solutions proposed by the RCA team in each case and descriptive statistics were calculated. Results 302 RCAs were reviewed. The most common event types involved a procedure complication, followed by cardiopulmonary arrest, neurological deficit and retained foreign body. In 106 RCAs, solutions were proposed. A large proportion (38.7%) of RCAs with solutions proposed involved a patient death. Of the 731 proposed solutions, the most common solution types were training (20%), process change (19.6%) and policy reinforcement (15.2%). We found that multiple event types were repeated in the study period, despite repeated RCAs. Conclusions This study found that the most commonly proposed solutions were weaker actions, which were less likely to decrease event recurrence. These findings support recent attempts to improve the RCA process and to develop guidance for the creation of effective and sustainable solutions to be used by RCA teams. Most states, including New York, require RCAs to be completed after a sentinel event.30 Despite the large prevalence of the RCA process in adverse event review and work to identify improved RCA techniques, a systems-based approach to RCAs, and in how to properly respond to the identified causes in a way that will increase system safety in a sustained manner, is not widespread. As a step towards this goal, this study aims to build on prior work by examining the types of solutions proposed in response to RCAs conducted at a large, tertiary care academic medical centre over an 8-year period. This is a qualitative and quantitative analysis of the content of RCAs performed at one large academic medical centre over an 8-year period. The goal of the study was to determine a taxonomy of solution types proposed by the RCA teams and to determine the number of solution types for all RCAs reviewed. Hospital leadership consented to data review and IRB approval was obtained prior to initiation of data collection. Occurrences were coded by type prior to submission, according to NYPORTS standards, and any occurrence coded as a serious reportable event’ required an RCA be conducted.31 RCAs were done within 30–60 days following the occurrence. At the study facility, the RCA was led by a member of the quality team from within the office of Quality and Safety. The typical RCA team was six to eight individuals and included one quality officer and at least one member of physician and nursing leadership from each involved or affected discipline. One to two face-to-face meetings were conducted in which involved parties were typically interviewed, with follow-up emails and phone calls used to reach consensus on the final report document. The report was then shared with the hospital's Safety and Risk Management Committee, and the Board of Directors' Quality and Patient Safety Committee and uploaded to NYPORTS, which allows analysis of multi-institutional data.22 The RCA team gave a final designation to each case, chosen from one of the following: ‘standard of care met, no action needed’, ‘standard of care met with room for improvement’, ‘standard of care not met, attributable to systems’ or ‘standard of care not met, attributable to individual practitioner’. Full records of all state-reported incidents at the study institution between 2001 and 2008 were obtained from the NYPORTS database in the form of a Microsoft Access database file (Redmond, Washington, USA). Data were deidentified, and a check for duplicates was performed. This database included all information reported by the hospital to the reporting agency during the study period. Data included patient demographic information, a description of the event and the proposed solutions. Only unique reports that reviewed reportable incidents for which an RCA was required were included. Cases designated as ‘standard of care met, no action needed’, for which no solutions were proposed, were reviewed in the initial analysis for case type but were excluded from the analysis of solution types, and no further analysis of these cases was conducted. Raters did not attempt to determine causation but rated the severity of case outcomes based on the information available in the RCA. For cases where ratings were inconsistent by more than two categories, consensus was reached by discussion during a second meeting. If case ratings were off by only one category, the more severe outcome was selected. Subsequently, the data were analysed using Stata (Stata 1C 11, College Station Texas, USA). Three hundred and two RCA cases were conducted during the 8-year study period. Duplicate records were excluded. All RCAs were included in the initial analysis; subsequently, those cases proposed solutions were included in the solutions analysis (figure 1). 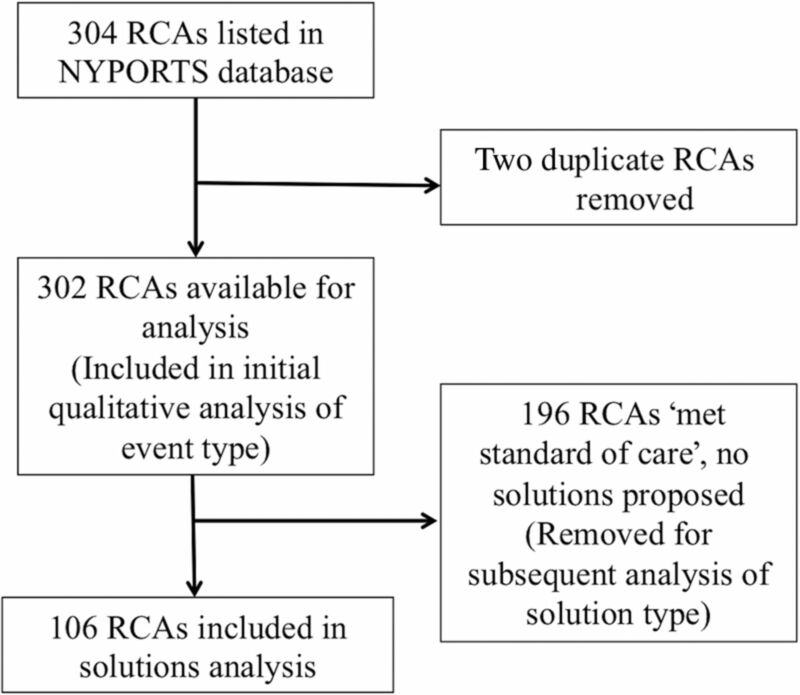 Table 1 shows descriptive information for all 302 cases, as well as severity outcome categories for RCAs in which solutions were proposed (n=106). A large proportion (38.7%) of RCAs with solutions proposed involved a patient death. Adverse events resulting in RCAs occurred throughout the hospital, most frequently in surgical departments (52.6%), with departments such as psychiatry and neurology submitting cases with the lowest frequency (2% and 1.3%, respectively). Determination of root cause analyses included in the study sample. The most common event types were procedure complication, cardiopulmonary arrest, neurological deficit and retained foreign body (table 2). The least frequent cases involved electrolyte imbalances, equipment failures or conducting the incorrect study for a patient. During the study period, several event types were repeated multiple times, including retained foreign body, medication administration error and wrong-site surgery. Figure 2 shows the recurrence of retained foreign body events during the study period, despite RCAs being performed for each of these events. Occurrence of retained foreign body events, as extracted from root cause analyses performed between 2001 and 2008. The average number of solutions proposed per RCA was 4.7, with 499 total solutions identified in the analysis (table 3). The most common category of solutions was training, most often proposed as didactic teaching, discussions at faculty/staff meetings or via in-service training. For example, in a case where a patient suffered neurological complications from an air embolism that occurred during an interventional radiology procedure, the RCA team stated that, ‘The treatment of air embolism should be reviewed annually for the staff in the angio[graphy laboratory] and interventional radiology departments and included as part of the formal teaching of Interventional Radiology residents’. Following a case of intraoperative nerve compression resulting in peroneal nerve injury, one of the proposed solutions was, ‘For educative purposes and to heighten awareness of the possibility this could occur due to positioning, this case will be reviewed at Anesthesia's…QI [Quality Improvement] Grand Rounds, and at Orthopedics’ QA [Quality Assurance] meeting’. The second most common solution type proposed was a process change, which could involve a change in workflow, a clinical protocol or procedures around communication. These solutions could involve training staff in the new process. For example, following a case where a patient had a respiratory arrest upon transport to MRI from the Surgical Intensive Care Unit (SICU), a clinical protocol in the form of a written algorithm was developed to determine the stability of SICU patients for transfer for non-urgent diagnostic testing. In another case, an incorrect surgical count prompted the performance of an abdominal X-ray; however, the entire abdomen was not imaged, and thus, a sponge was not identified at the time the X-ray was read. The proposed process change to facilitate communication was, ‘The surgeon and the radiologist should collaborate with regard to the plan for imaging the area under review’. The third most commonly proposed solution was policy reinforcement. In this category, the RCA team stated that a policy already in place would be emphasised to staff. For example, in another surgical case of a retained sponge, the RCA team stated, ‘Analysis confirmed that our counting policy is effective as written despite this occurrence. However, sponge was retained. Human error determined to be a factor’, and thus proposed the following solution: ‘Re-emphasise policy and procedures at OR staff meeting and at the next Perioperative Service Chiefs meeting’. In a case where two patients on a unit had the same last name and the wrong patient received a ventilation/perfusion scan, the RCA team proposed the following solution: ‘Staff were reminded of the correct procedure for identifying patients’. This study examined RCAs performed at a major US academic medical centre over an 8-year period. We determined the categories of cases being reviewed by the RCA team, as well as the types of solutions proposed to reduce similar future occurrences. Analyses such as this provide a crucial step to understanding the RCA process and to provide a framework to facilitate future studies that examine the utility of the process. The safety industry recognises that a hierarchy of safety interventions exists, the power of which can lead to greater or lesser improvements in safety. In its most general form, the hierarchy is as follows (from most effective to least); (1) Design changes to remove the hazard, (2) Guard (physically) against the hazard, (3) Warn the personnel about the hazard.35 Relatively few of the solutions offered by the RCA teams included design of changes to remove hazards, and we believe that this is representative of RCAs as performed throughout the USA. We found that in this time period, RCAs were performed for cases from most services in the hospital with the most common being surgical cases. This coincided with the fact that the greatest proportion of cases was related to a procedure complication, the risk for which is higher during surgery than in other hospital settings, as a higher frequency of procedures are performed there. The frequency of different types of cases may also be related to the types of events that are required to be reported in New York. Our data showed a high (38.7%) rate of patient death related to the adverse event; however, there is likely under reporting of patients who are less severely injured, making this likely to be an over-representation of overall severity.36 In figure 2, we show that, despite repeated RCA team examination of retained foreign body events, occurrences of that same event continued throughout the study period. While recognising that some types of events are impossible to eliminate completely, we propose that repeat events occur despite repeat RCAs because of the quality and types of solutions that are proposed by RCA teams. The effectiveness of the RCA process has been questioned in the literature previously, but few studies have critically examined the process as it is used in healthcare to review sentinel events.14 Many times, the RCA does not identify meaningful aspects of the event but simply observes that humans are imperfect. For example, failures involving people forgetting something previously known or taught to them simply observes that human memory is imperfect. This finding is trivial and will not contribute to sustainable change without some kind of change in the work setting to support the cognitive work of the healthcare worker or reduce the burden of having to remember critical pieces of information. Additionally, in healthcare, many errors are ‘slips’ or ‘lapses’ that occur when the practitioner is in automaticity mode and is not consciously thinking about his or her actions. To begin to address errors due to ‘slips’ and ‘lapses’, the conditions under which these errors occur must be identified.37 ,38 Systems-based changes have been found to be most effective in mitigating safety in other industries; however, this has not yet become a standard of practice in patient safety in healthcare. Our data around policy reinforcement highlights one of the most compelling demonstrations of the ineffectiveness of RCAs, as they have historically been performed in the USA. In what resilience engineers would refer to as the ‘work as imagined’ space, we see solutions such as reminding staff of the correct procedure, and human error was determined to be a factor. This violates the basic premise of safety engineering involving sociotechnical systems, which recognises that human errors will always be repeated. Just as our parents taught us when we were toddlers, human error is inevitable, thereby proposing a solution for safety mitigation that focuses on reminding people not to make mistakes is an indictment of our approach to safety. Work done by our team examined the same categories of RCA solutions discussed here and, through front-line personnel and discussions with safety science experts, developed a model of sustainability and effectiveness for solutions.23 In that study, the categories developed in this project were used to determine the effectiveness and sustainability of different solutions proposed by RCA teams. This work showed that solutions, such as technology changes and institutional-level changes, were most effective and sustainable, and solutions, such as counselling and disciplinary changes, were the least effective and sustainable. This study can serve as a basis for future analyses of the effectiveness of the RCA process for preventing similar future occurrences. It is clear that RCA teams need validated tools to use when proposing solutions in order to meet the goal of reducing future similar outcomes. However, no trials have examined the effectiveness of the process or its proposed solutions.10 Therefore, more work needs to be done to specifically review interventions and evaluate their quality. RCA teams need guidance on solution types and the timing of their implication, and this needs to be validated in order to propose the most effective solutions for change. Work needs to be done to determine how to study near misses and hazards to include information from these events in proposed solutions, as these events are often incredibly informative and predictive of future events but are often not evaluated. There are limitations of this study, which should be considered when interpreting our results. This study was performed at a single institution. However, this institution performs RCAs in a manner similar to other major medical centres across the country and is in accordance with Joint Commission recommendations.39 A multicentre study of RCAs is needed in the future, as studies of the RCA process are scarce. While an 8-year period is likely representative of the types of RCAs and the solutions proposed, examining a greater length of time might also reveal more about the process. We were unable to review each case in detail and each solution in context, as this information was not submitted to NYPORTS, which may have yielded more information about the derivation of the different solutions. Our study evaluates the RCA process as performed at a major medical centre, building on prior work to classify and understand the recommendations being made by RCA teams. Our results show that certain event types are seen repeatedly, even following recommendations from RCA teams. Our qualitative analysis reveals that solution types most commonly proposed are not usually the types shown to be more effective and sustainable in other industries. Our study highlights the need for further critical evaluation of the RCA process in healthcare in order to understand if and how the process can be improved to meet the goal of reducing error and increasing patient safety. Joseph Duckett, Diane Cockrell, Robert Panzer, MD.
. The end of the beginning: patient safety five years after “To Err Is Human”. Health Aff 2004;Suppl Web Exclusives:W4–534–545.
. Safety in numbers: the development of leapfrog ‘ s composite patient safety score for U. S. Hospitals. J Patient Saf 2013;9:1–9.
. Techniques for root cause analysis. Proc (Bayl Univ Med Cent) 2001;14:154–7. http://www.ncbi.nlm.nih.gov/pubmed/16369607. , The New York model: root cause analysis driving patient safety initiative to ensure correct surgical and invasive procedures. In: Henriksen K, Keyes MA, Grady ML, et al., eds. Advances in patient safety: new directions and alternative approaches. Rockville, MD: Agency for Healthcare Research and Quality, 2008.
. Human factors engineering design demonstrations can enlighten your RCA team. Qual Saf Health Care 2003;12:119–21. NYPORTS—The New York Patient Occurrence and Tracking System—Annual Report 1999. https://www.health.ny.gov/press/releases/2001/nyports/nyports.htm. 2001 (accessed 8 Sep 2015). NYPORTS—SECTION 2: CLINICAL DEFINITIONS MANUAL. http://www.nashp.org/sites/default/files/NY_PORTS_Clinical_Definitions.pdf. Published 2005 (accessed 8 Sep 2015).
. Papers that go beyond numbers (qualitative research). Br Med J 1997;315:740–3.
. Qualitative research in health care. Analysing qualitative data. Br Med J 2000;320:114–16.
. Safety Hierarchy: Design Vs. Warnings. http://www.visualexpert.com/Resources/safetyhierarchy.html (accessed 8 Sep 2015).
. The role of error in organizing behavior. Ergonomics 1990;33:1185–99. Joint Comission. Framework for Conducting a Root Cause Analysis and Action Plan. https://www.jointcommission.org/framework_for_conducting_a_root_cause_analysis_and_action_plan/. Published 2013 (accessed 8 Aug 2016). Correction notice This article has been corrected since it first published Online First. The abstract has been restructured to include a conclusions section. Funding This study was funded by the ‘Year-Out Research Fellowship’ grant from the University of Rochester School of Medicine and Dentistry and by the Emergency Medicine Patient Safety Foundation. At the time of this study, RF was supported by a Career Development Award from the NIBIB, K08EB009090. Ethics approval University of Rochester School of Medicine and Dentistry.